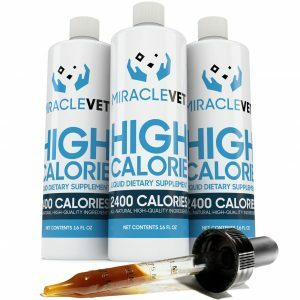 Miracle Vet dog weight gainer can help any dog. Dogs may be underweight or skinny for many reasons. Some dogs are perfectly healthy, and just naturally lean, while others may be ill-fed or neglected at home. Before learning how to make a dog gain weight, you want to be sure an underlying condition isn’t the cause. Your veterinarian can help you, if your dog is not eating. Before you attempt any treatments on your dog, he should be examined by a qualified veterinarian to make sure they are healthy and do not need treatment care of any kind. Intestinal parasites (worms) are a common reason, even though your dog eats well and seems healthy otherwise. Issues such as kidney failure, anemia, and pancreatitis are uncommon. However, they can cause weight loss. Another cause may be the dog may have eaten garbage or some non-food object that is causing a bowel obstruction. A dog at his healthiest body mass will have a waistline, and his abdomen will be tucked up. The ribs should not show through the skin, but you should be able to feel them when you stroke the dog’s sides. A too-skinny dog should have a weight-gain program that allows them to gain gradually to avoid stressing his body systems. The gradual gain will be more permanent allowing your dog to put on the pounds quickly. For this article, we will assume your dog has been given the ok from your vet, and is free from worms, and has been treated for any medical issues. If your dog is recovering from a medical condition, ask your veterinarian for specific advice during recovery. He may recommend a high-calorie prescription diet for your dog. The key to appropriate success is to add calories to the diet and exercise to build muscle instead of adding fat. The type of food you feed your dog plays a significant role in weight gain. 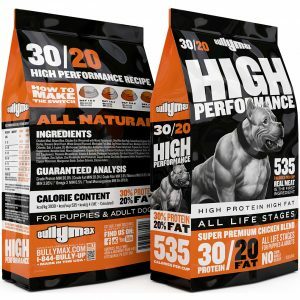 High-quality, high-protein dog chows are best for providing the proper nutrition for your dog. Poor quality dog chows are usually corn-based, and many dogs have allergies to corn products. Cheap kibble also has more filler, and your dog will need to eat more, to get the required nutrition. And your dog will even leave bigger doggy piles in the yard. Investing in a high-quality chow will not be any more expensive in the long run. Canned food has more calories than dry, but may also have more fat. Whichever dog food you choose, be sure that there are no fats listed in the first four ingredients. Excess fat in your dogís diet may lead to pancreatitis. You may choose to supplement his dry chow by mixing some canned food into it at mealtimes. Adding some high-protein people food to his meals and diet can help them, too. Meat scraps with the fat trimmed off, cheese, eggs and cooked vegetables (It’s better on the dogís digestive system than raw) are sound recommendations. Not all people foods are good for dogs, though, and some may even be harmful. Avoid feeding your dog onions, garlic, grapes, chocolate, and fruit pits or seeds, among others. Add some low-impact exercise to your dog ís weight-gain program, so the extra calories turn into healthy muscle instead of unhealthy fat. Swimming, walking, and playing fetch is all good choices.